Prices starting from Euro 52 per person. Falconry has been an Intangible Cultural Heritage of Humanity since December 2016. The important recognition and registration of the Italian falconry Art to the UNESCO Representative List confirms the cultural value of this ancient discipline. 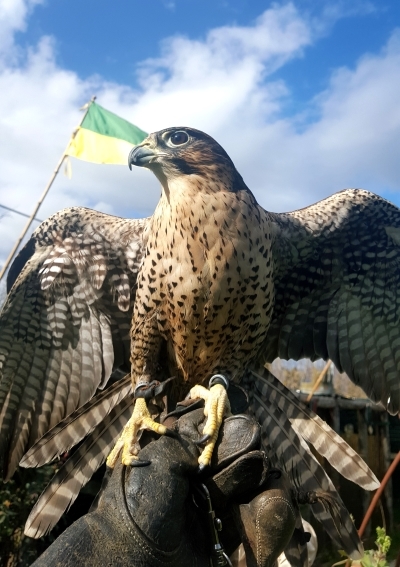 The experience that we arrange, will take you on a back in time trip, in order to learn about the ancient art of falconry, the role of falconer in various historical periods and the world of falcons. You can watch the flight of diurnal birds of prey and call them to you, by wearing a falconer's glove. Each participant will receive a certificate and some cards in memory of the experience with the falconers and the beautiful birds of prey, which you can admire in their splendor, while flying over your heads. You will be accompanied and followed by a qualified and professional staff, with a graduate interpreter for Italian-English translations. The falconers can come directly to your holiday home, and will bring with them a nice setting for falcons and hawks flying exhibition. Alternatively, if you prefer to go elsewhere, this meeting will be organized in a farmhouse with a large garden in Cortona (Arezzo). Duration: 2 hours, usually from 10:00 to 12:00. Ideal for adults, families or groups with children aged over 12 years. Fun in complete safety even for the little ones. Make your stay in Tuscany even more special!